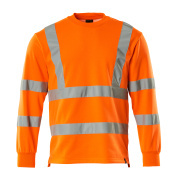 If you have a job where visibility is crucial to your safety, MASCOT offers hi-vis jumpers in fluorescent colours that are certified according to EN ISO 20471. MASCOT’s hi-vis jumpers are often used by craftsmen who work near traffic or on construction sites where it is important to be visible to the surroundings. MASCOT’s hi-vis jumpers keep you visible both during the day because of the fluorescent colours and at night by means of the attached reflectors. MASCOT hi-vis jumpers are available in different variants. You will find both hoodies, polo shirts and sweatshirts. Several of the jumpers are available both with and without zipper. If you for example work in alternating cold and warm temperatures, you can benefit from selecting a jumper with zipper so you can quickly put it on and take it off. The hi-vis jumpers have a number of features that you do not want to be without. You will find, among other things, hi-vis jumpers with practical pockets with zippers for secure storage of for example tools or a mobile phone. Several of the pockets have strong zip-pulls so you can easily access your tools both with and without gloves. The jumpers are available in three different hi-vis colours, namely red, orange and yellow, as well as in two-tone colour combinations. The hi-vis jumpers are available in a classic spacious fit, as well as a modern slimmer fit. MASCOT offers hi-vis jumpers with different fits so you can choose a jumper that fits you perfectly. To further give you high comfort, hi-vis jumpers with ventilation under the sleeves are available so your body temperature is better regulated during physically active work. Several jumpers are manufactured in a combination of cotton and polyester. The soft cotton is placed on the inside in order to make the jumpers comfortable to wear. The polyester is located on the outside, as the fabric is durable and gives the jumpers longer service lives. The jumpers are available with chevroned or horizontal as well as vertical reflectors that make you visible, regardless of which side you are seen from – even from a long distance. 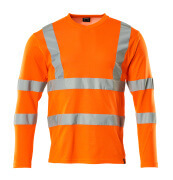 Moreover, many of MASCOT's hi-vis jumpers have elastic reflectors in order to give you extra freedom of movement.